Crisp and rich shortbread base topped with a whipped pumpkin mousse. Betcha can’t eat just one! Place almond flour and salt in a medium sized bowl. Whisk to combine. Add remaining ingredients and mash with a fork until combined. Knead with your hands for a couple of seconds. You’ll know it’s perfectly mixed when the dough holds together in a ball. 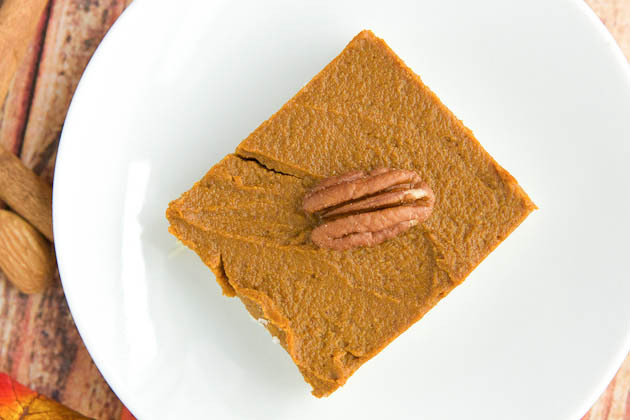 Press into a 8×8 square pan and place in the fridge for 20 minutes. Place all ingredients in the bowl of your food processor or blender. Pour into prepared base and smooth out with a spoon. Bake for 30 minutes in the preheated oven, until the pumpkin edges away from the sides and the top begins to crack just slightly. Remove from the oven and place on a cooling rack for a couple of hours, until completely cooled. Cover and place in the fridge overnight to set. 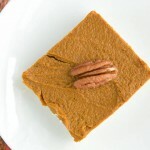 Afterward, cut into squares, top with pecans if desired and enjoy! Will keep in the fridge for up to a week. Do not freeze. Feel free to use any type of liquid sweetener for the gluten-free shortbread base. Honey (not vegan), maple syrup, date syrup, yacon syrup, or agave should work.